The AFG 18.1AXT elliptical is of 114 kgs and operates at 110 volt ac and is designed by experts for result oriented exercise at home. . Its inclination range is from 0% to 100% , provides a 5% increment. The high stride length, which is of about 19″ to 21″ makes your exercise more effective and comfortable. Its 23 lbs flywheel provides less stress to your joints The additional feature of AFG 18.1AXT elliptical are the 5 LED display and the inbuilt digital speakers. High-end construction and components that fit you better– A heavy-duty 23-lb. flywheel offers a fluid, comfortable motion for a consistently smooth, quiet workout. The new, durable specialty ascent trainer frame looks better and lasts longer, and features a variable stride length of 19 to 21 inches, so you can find the perfect movement for you. The 18.1AXT elliptical or cross trainer simulates a true walking, running or even stadium climbing movements, and offers a low-impact workout at any of the 20 levels of power incline. Industry-leading service and warranty protection– In addition to a lifetime frame warranty, AFG elliptical or cross trainer offers a two-year incline motor warranty, three years on parts and one year of unlimited in-home repairs. 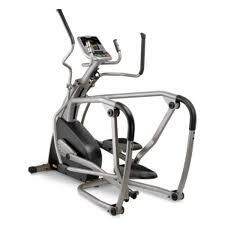 More tools to meet your needs-The 18.1AXT elliptical or cross trainer offers more tools to meet your needs. This treadmill is Made for iPod, so you can dock and control your iPod directly from the console. The easy-to-read, 16-digit alphanumeric LED provides more of the instant, at-a-glance feedback you need. And you’ll always stay motivated while the dynamic, built-in speaker system lets you blast your favorite workout tunes. Advanced workout tracking, more workout options– Smarter features like our exclusive proFILE™ performance tracking technology enables up to two users to monitor and evaluate a variety of workout statistics, including time, calories, watts and distance, to help you reach your fitness goals faster. Additional programming, including 11 preprogrammed and 3 customizable workouts, gives you more training options and keeps your fitness routine fresh. Nike + iPod workout tracking-Join one of the world’s biggest workout groups with Nike + iPod, which automatically saves all your workout data directly to your iPod® so you can track your progress on nikerunning.com. Simply connect your iPod device to the Made for iPod connector and begin your workout while your pace, distance, time and calories burned are saved to your device. Once you’ve finished, connect the iPod to your computer, where iTunes syncs your workout data directly to nikerunning.com. Every workout is there, ready for you to review. TreadmillDoctor.com This is very similar to Vision's Suspension trainer for a lot less money. The latest cost of AFG 18.1AXT Elliptical will be updated soon. *Note: Most of the sites, stores or shopping portals listed above sell AFG 18.1AXT Elliptical with discounts and other exciting offers. There is a possibility that the some of above websites are not selling AFG 18.1AXT Elliptical now. Toughtrain.com is not liable for such cases or instances. Also we do not recommend any seller for AFG 18.1AXT Elliptical and a buyer should buy from where he/she gets best deal with quality of products, service and on time delivery (shipment).